Getting Virtual Instruments and Samples into REAPER. Previously, I discussed soundcards, Virtual studio technology instruments (VSTi's) and samples (here). We have also covered how to install REAPER on your computer, here. Now, we're ready to go one step further, installing VSTi's on your computer. Part 1: Installing VST's in REAPER. VSTi's are one of the most popular and easy ways to start making music on your computer. By and large, VSTi's are often easily manipulated, easier than say, a sample can be, due to the fact the sound is being made through very complex maths which can be tweak by, say, the tune of a dial, or by flicking to another preset. Downloading and installing VSTs can seem complicated at first, but videos like this one below, from youtube user Mark Spencer make the process much less daunting. Sidenote: Even if you don't need help installing VST's in REAPER, do make sure you check out Mark's youtube channel for other helpful videos. Part 2: Using Vember Audio's Shortcircuit multisampler VST to load and play samples in REAPER. Whilst REAPER is full of amazing features, one thing it doesn't have is a dedicated multisampler VST. REAPER does have it's own sampler, ReaSamplOnmatic5000, but this only loads one sample at a time, meaning that loading and playing multiple samples becomes a laborious task. You need to insert a new track with ReaSampler5000 inserted for each sample you want to play; as well as assigning a different midi key to trigger each sample separately. It gets tiresome. This is where Vember Audio's absolutely amazing Shortcircuit multisampler VST comes into its own. 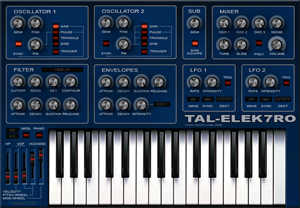 As the name suggests, a multisampler loads up numerous samples and allows you to play them quickly. Shortcircuit allows you to click and drag numerous samples from your documents folder (or wherever else you are keeping them on your computer) onto a Piano Roll Editor in one go. This saves an amazing amount of time. Check out another great video of Shortcircuit in action here, then download it here. Since writing this article, Shortcircuit 2 has been released. I am sure it is a fantastic piece of software, but I'm so in love with version 1, that I haven't given version 2 much attention. If you have, let me know which one you prefer and why, in the comments section below. To load Shortcircuit into REAPER, simply follow part 1, above. ReaSamplOnmatic5000 does have it's uses. For instance, following a recent update, you can now audition sounds in the same folder as the loaded sample, by clicking a drop down button. Not only that, but - joy of joys! 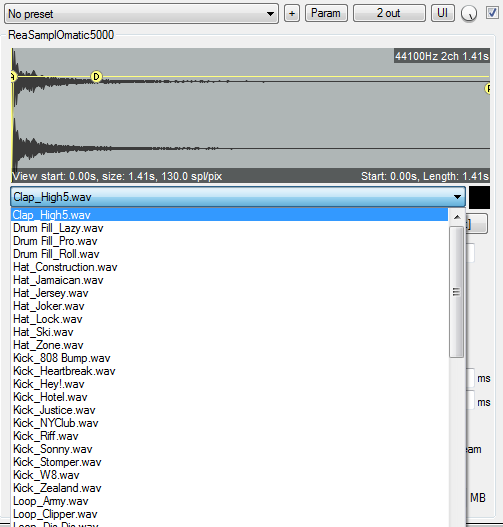 - you can now edit the samples ADR envelope in REAPER, both functions are visible as per the screenshot to the right. Like the look of that wave form, do you? Approve of the names of those samples, yeah? Well, you're in luck. Check them out here, then download them for free, here. Part 3: So, you know how to load VST instruments, and you have loaded and installed shortcircuit, what now? I recommended that you check out the Freeware section and, if that wasn't enough freeware for you - although I think it should be for now - check out the Weblinks section for sites specifically relating to freeware. UPDATE 26/01/2014: Check out this great video by Mad Zach listing his top 5 free VST's, included in his list are some The New Beatmaker favourites.